The accompanying article [link http://www.pbs.org/newshour/updates/climate-change/july-dec12/chicago_10... will give educators a good idea of how to use these photographs in a classroom. It contains more background information, videos, and an excellent info graphic. The background article describes the rationale for constructing green roofs and other improvements to reduce energy and stormwater runoff. Comments from expert scientist: The material presents the impacts of several technologies on the warming due to the urban heat island as well as regional or global warming. 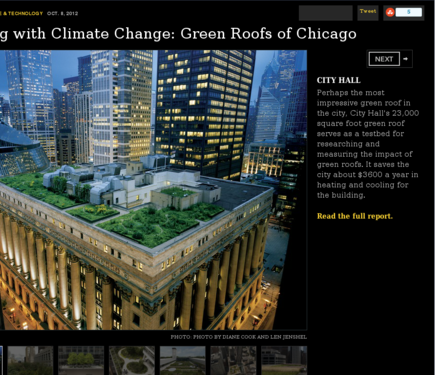 These include green roofs, permeable pavements, and urban forestry. The explanations are well presented. The project does not appear to have been updated in several years. There is a reference to the 2010 dashboard, which is a bit old. While no specific lesson accompanies this slideshow, it serves to spark the interest of students in viewing how cities are coping positively to the changes in climate. Slides/photographs are linked to main featured news article, which is supported by interviews from critics, info graphics, broadcast videos and links to the PBS Coping with Climate Change web page. Visually appealing photographs to inspire students to think about how science drives engineering design.